Louisiana has the 28th highest incidence and 2nd highest death (mortality) rate of breast cancer in the U.S. (Figure 1 & Figure 2). 124.1 people per 100,000 were diagnosed with breast cancer, while the national average was 126.0 per 100,000. An average of 23.7 Louisiana residents per 100,000 died each year from this disease, while the national average was 20.9 deaths per 100,000. 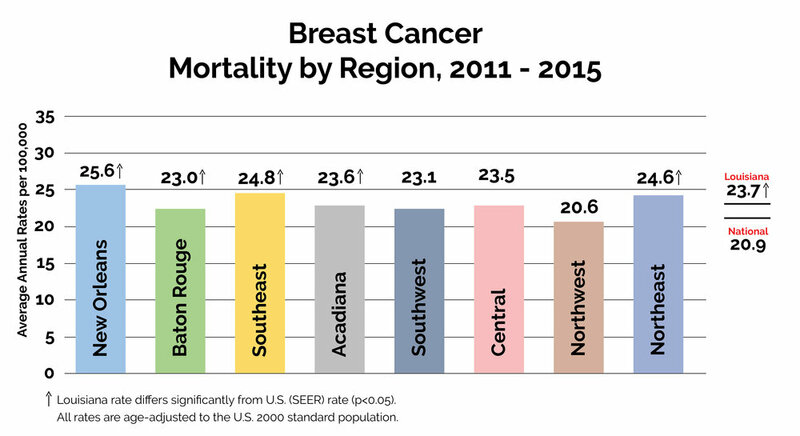 New Orleans, Southeast, Northeast, Acadiana, and Southwest, Louisiana have the highest breast cancer death rates in the state (Figure 3 & Figure 4). Breast cancer is an equal-opportunity killer, with Louisiana white women are slightly below the national death rate while black women are significantly higher than the rest of the country (Figure 5 & Figure 6). Breast cancer is one of the less-expensive cancers to treat. However, the treatment and follow-up care can be a strain financially, even with health insurance.